I like to bring my iPod, to keep me entertained. I listen to Metallica to keep me in a rage. As a composition student, David T. Little recalled bringing an angry anti-war work to one of his teachers who counseled, "You know, I don't need a piece of music to tell me that war is bad," and it was good advice. Instead, in Soldier Songs Little focuses on the larger issue of what war does to fighters and those who might be, to brothers, fathers, sons and friends, to the bonds that we forge over time. The result can make one squirm. Among an army of young composers, Little is one with omnivorous influences, including heavy metal, electronics, and musical theater, and Soldier Songs exists in two versions: one for orchestra (presented last spring at New York City Opera's Vox series) and the one here, for baritone and amplified chamber orchestra—here the Newspeak Ensemble, impressively conducted by Todd Reynolds. The result, in eleven sections, alternates between grinding machine-like noises and more lyric interludes, with taped texts culled from veterans interspersed like numb commentary. Musically, the texture is just as likely to flare up in a wall of sound before dying out in a trail of soft ticking sounds. 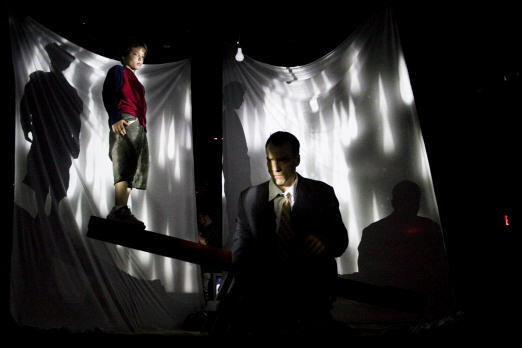 Presented at Le Poisson Rouge, one of the New York's newest venues (former site of the Village Gate), the spare production placed the audience surrounding Chisato Uno's set, a sandbox with a brown seesaw in the center. Later in the evening, white sheets rose on all four sides, evoking tents, which director Yuval Sharon effectively transformed into canvases slashed with blood. 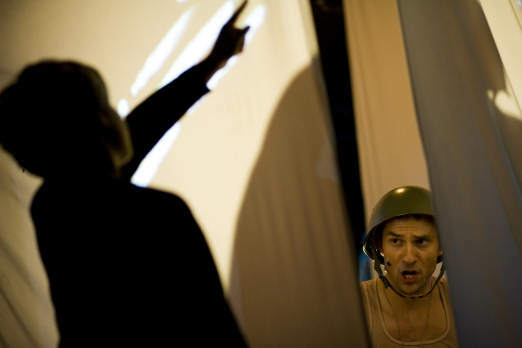 Uno's costumes for the two characters were simple: the Soldier in sand-colored briefs and t-shirt before donning a dark suit later in the piece, and the Boy in simple pants and shirt, as if he were off to the park to play baseball. Aside from evoking playground innocence, the seesaw was used in other ways, such as when the Soldier and the Boy, played by David Adam Moore and Brandon Rakowski, are at either end, eyeing each other, often off-balance. Sometimes the plank seemed like a bridge between the two; at others it appeared to highlight their differences. One is trained to fight; the other is trying to learn from what he sees. When the Soldier strangles or shoots, the Boy does the same, his actions mirroring those of his mentor in uneasy symmetry. Moore, singing with discomfiting intimacy, was in powerful voice, his rich sonority capturing pain, regret, and even a bit of surprise, as if he couldn't quite grasp what kind of person he had become. Soldier Songs has the force of emotions tossed around, allowed to bruise each other and then served up raw.